Diarrhea in dogs can be a common concern. Dogs are curious beings that like to bite and consume everything that they come across. This can cause health concerns like indigestion and diarrhea. You should not worry about diarrhea in dogs, unless it persists for more than a day or if it is frequent. There are several factors to consider when it comes to treating and preventing diarrhea in dogs. An efficient treatment or prevention of diarrhea starts by identifying the root cause. Sudden diarrhea in an otherwise healthy dog can be due to scavenging. Once you strike off the prime possible cause, i.e. scavenging, the other causes to investigate are stress, diet or bacterial infections. If the condition seems severe, the trigger can be a viral or bacterial infection. You need to also consider more chronic causes like liver failure or heart disease if the diarrhea is persistent and is associated with blood streaks. Dogs diagnosed with diarrhea should be given detailed attention. If your dog is aged, it is ideal to contact your local veterinarian. On the flip side, you can try and reduce the impact by following certain tips. Ensure that your dog stays dehydrated. Give him access to plenty of fresh water. Take him off any heavy diet; offering rice and small pieces of chicken in small quantity is a good start. Ensure that you take off meat bones or skin from his diet. Closely observe your dog for any signs of lethargy or excessive watery stool. If the condition is not improving, do not hesitate to contact your veterinarian. On some occasions, diarrhea is associated with vomiting. This is a bit serious concern that requires some serious attention. Under such a circumstance, take your dog off all kinds of diets for half a day, while providing an adequate amount of fresh water throughout the day. Closely observe your dog and if the vomiting subsides, start giving him a bland diet. A bland diet is a combination of boiled rice and small pieces of chicken. Observe the stool consistency while gradually increasing the portions throughout the day. Prevention of diarrhea in dogs can be a serious challenge. You have to keep a close eye on your dog and ensure to train him to stay away from scavenging activities. Keep your backyard and indoors clean and make it a point not to keep small toys or anything he can chew or swallow out of his reach. 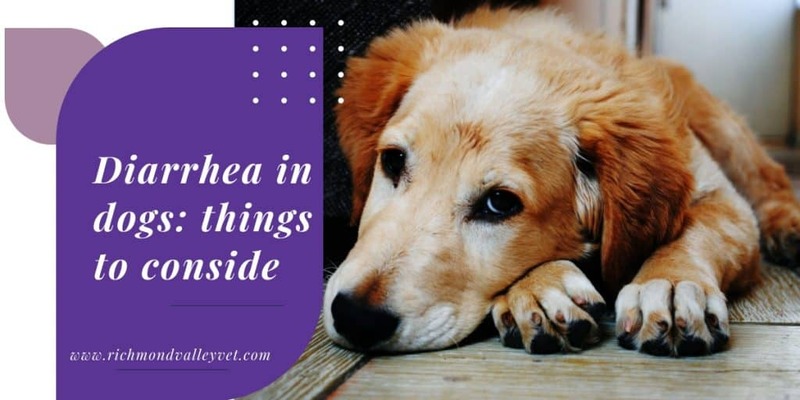 Always ensure that you are aware of the different symptoms associated with diarrhea in dogs. Most of the dog parents are unaware of the fact that concerns like depression, vomiting and lethargy can be associated with diarrhea. Keep a close eye on your pooch, especially when you are taking him for a walk. Make sure that he doesn’t scavenge and observe his activities when changing his diet.